Bush stayed in a second grade classroom for almost another half hour instead of performing his ostensible duties as Commander-in-Chief. His aide, Andy Card, did not even wait for Bush to reply with additional questions, orders for the Air Force or to inquire if this would cut short the photo op. "Oh No! They told me they were going to do this, and they really did it!" 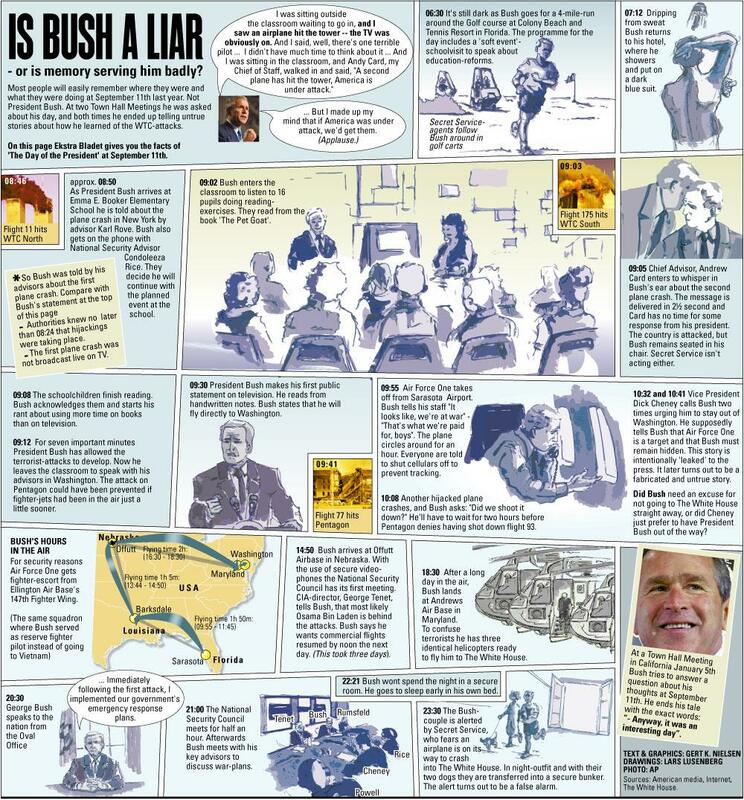 If the Secret Service knew Bush was safe, how come they didn't know Cheney was safe? After all, no plane crashed into the White House that morning. Of course, to a non-conspiracist there is very little difficulty explaining this. Cheney was hustled out of the White House because it was an obvious, recognizable target. Booker Elementary would have been much tougher to spot from the air; one elementary school looks pretty much like any other, and there are lots of elementary schools in Sarasota; Google lists 42 within the city limits. In addition, moving the President is not just a matter of hustling him into a waiting limousine; routes have to be cleared, police have to block side streets, etc. 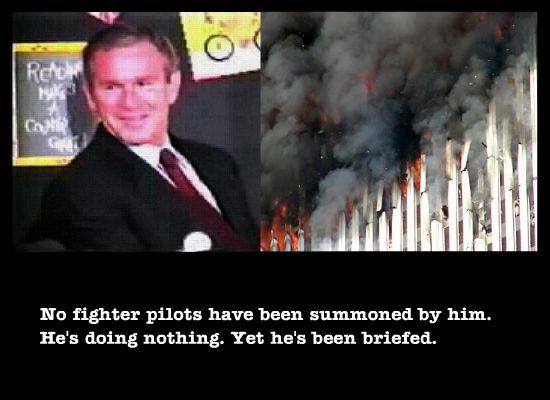 But the issue of Bush's non response is that as commander in chief, he ostensibly would be needed to issue orders (such as a shootdown) and his entourage always keeps him in constant communication with the military's leadership. The fact that Bush thought it more prudent to listen to second graders rather than assume his role as head of the National Command Authority shows that Cheney is the real, de facto President.